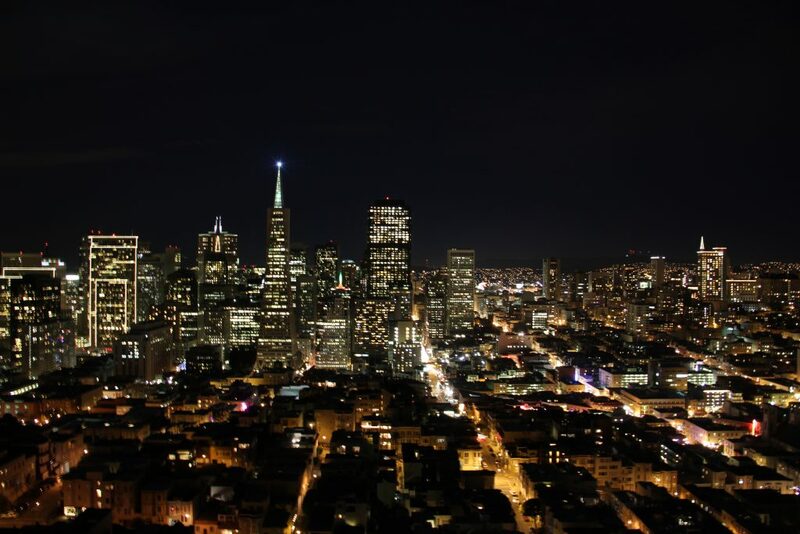 San Francisco Skyline, which I photographed on December 24, 2012. While staying in Rome, Italy in August 2013, I discovered a tactic to be confused with a native Roman as a tourist: Carry a plastic-bag with some groceries with you. This sounds strange, but it seems to work, as I found out by accident: I had gone on a daytrip to explore Pompeij early in the morning, and when driving back to Rome in the afternoon, I had bought a big bottle of water at a rest stop, and they had put it in a white plastic bag. When the bus then dropped me off close to the hotel, I realized that I was hungry and started walking down Via Veneto with my bag. Now, the previous days, I had often walked the same street and tried to be not noticed as a tourist, but to no avail: Even though I talked to people only in my best Italian (which, frankly, still has a strong accent), they always responded in English. Very often when I passed restaurants, the waiters outside would approach me: “Good evening, mister. Want something to eat…” My outfit was as neutral as possible – black T-Shirt and black pants – so that couldn’t have been the reason. Now, that day, with my plastic bag, nobody in the street approached me. One waiter seemed to look at me: “Good evening, Sir, want something to eat?”, but went right past me to a guy with a camera around his neck. In Rome, there are also men standing in the street, aggressively approaching any tourist, handing out coupons to some overpriced tourist-events. Well, tonight, I went past a few of them – and they didn’t seem to care at all about me: They looked briefly, and then continued scanning the street for potential clients. The plastic-bag was amazing! When I entered a bar to buy a sandwich, I tried ordering in Italian, but was really clumsy. Still, the waiter responded in Italian, and when I couldn’t answer in his language, but said: “Take-Away, please”, he was genuinely surprised: “Sorry, Sir, you really look Italian!”. So, the plastic-bag helps to blend in better. I could have guessed so, because tourists probably don’t go grocery-shopping as much as natives, but still, the effect was incredible. When I went out of the bar, eating my sandwich, looking particularly casual and un-impressed by the surroundings, some American girls in their early 20s passed me, and one remarked while looking in my direction: “Wow, the Italians really are cute!”. This proved the point to me again, and now makes me wonder if I should have talked back to them in a particularly awkward, fake-Italian-accented English. There could have been adventures coming, but maybe my imagination there is more spectacular than any real thing that could have happened. The whole situation with the bag reminded me of a similar effect that my friend Miles and I observed when we visited San Francisco on Christmas 2012: We both share the same taste and wore nice-looking, not expensive but elegant winter-coats. I looked a tad more elegant, because Miles was wearing a Santa Claus hat – not for looking funny, but because it was his warmest hat. As we walked down the streets of San Francisco, we were approached a lot by beggars. It was quite noticeable: Beggars picked us out specifically, even if there were larger groups of people around us. Miles’ theory was that the coats made us look rich. “Hey, they’re wearing coats, they gotta have money” – a thought which he assumed the beggars had. At first, I thought was a joke. But as more and more people approached us – and after we got some scary looks by a few rather creepy ones as the night became darker – I became convinced how true the saying is: The coat makes the man. So does the plastic bag. Two accessories to blend in any setting in a new town. This entry was posted in Observations, Travel and tagged California, Rome, San Francisco on October 2, 2016 by Alexander_Tuschinski.